During a week that I’ve spent more time interacting with the healthcare system than I’d perhaps like, it’s been interesting sharing OpenAPS with both the Diabetes healthcare world and those in the surgical area. Let’s start with the Diabetes area. It was my annual pump clinic appointment and as per usual, I turned up, did the pre-appointment blood checks and weigh-in then sat and waited to be called in. On this occasion I was called in to see a specialist registrar so we sat down and I explained what I do to manage my diabetes. When I mentioned OpenAPS, it transpired she’d been at the training session given to the staff and students at Guys, and therefore was aware of it. I then walked her through my Nightscout page and explained about oref1 and it’s benefits, especially when combined with Fiasp (which, incidentally has now stabilised for me). We took a look at my Hba1C, which was great (5.5%!) and of course the other big benefit is time in range. The upshot was a good session where I felt comfortable explaining to the person I spoke with the new features of OpenAPS. It was a very reassuring appointment, and the letter to my GP acknowledged my use of the tools. It was pleasing that the team at Guys and St Thomas’s are very aware of what “We are not waiting” is doing. It was a pleasure to speak to a diabetes team that were both aware of the OpenAPS platform, and supportive of its use, understanding that there are these types of project that can really make a difference to life with T1D. My second visit was in rather less fortuitous circumstances, having been woken by severe abdominal pain overnight on Thursday night. The GP visit resulted in a referral to A&E to rule out appendicitis. 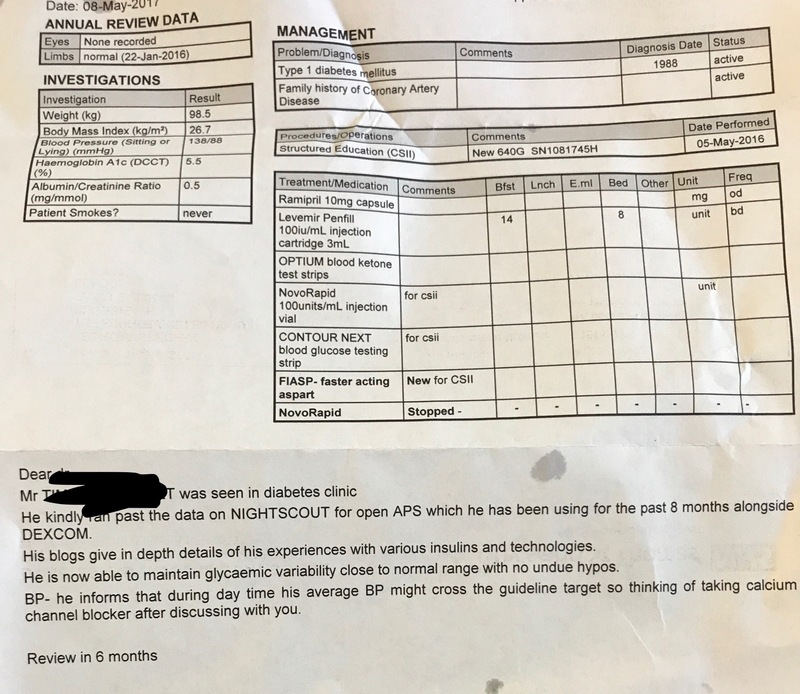 On arrival at A&E (I’d elected to use the same hospital that looks after my diabetes care, for probably obvious reasons), we went through the usual arrival checks and I was asked for a recent “BM”. Now for those outside UK healthcare, thanks to proliferation of Boehringer Mannheim testing gear in the 80s and 90s, the NHS tends to refer to fingerpricks as BM tests or simple “BM”s. 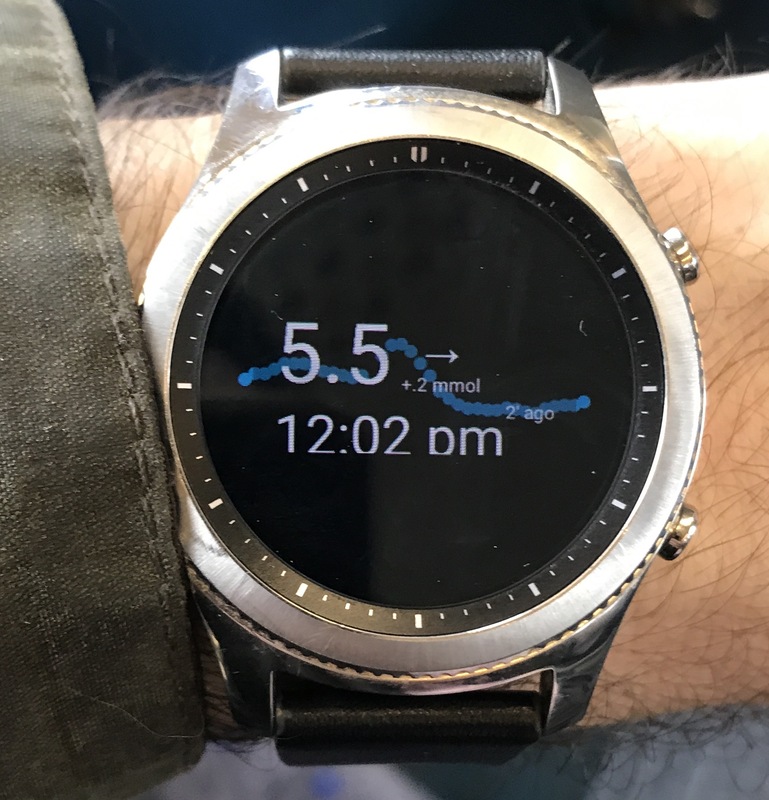 I responded by showing the A&E nurse my current glucose on my Smartwatch, and his jaw dropped. I then went on to explain the technology I was using and the benefits it provided, and both the nurses manning the A&E reception were all ears. They thought it sounded brilliant and suggested that I speak to someone at one of the London clinical centres about running a trial for it properly. It was great to see such interest in the technology outside the normal diabetes circles and the realisation of what it could do to help. Once I was admitted, I was once again seen by a doctor, to whom I explained my set-up. Whilst they may have been less interested in it, they were impressed with the results and the achieved time in range. It came up again a few times over the duration that I was in the assessment ward, and the staff were generally very interested. They seemed to understand the benefits of having it there keeping things running whilst there are other things going on, allowing them and me to focus on the reason I was there and not have to take the T1D into as much consideration as they normally would. So what have I taken away from this? The staff in various departments at Guys and St Thomas’s hospital trust in the NHS appeared very open to the use of technologies such as this. They found it fascinating and interesting, seemed to understand the benefits it could bring and also used it as an indicator of the type of person with whom they were interacting. All in all it was a very positive experience for me, and I hope also for the people I ended up explaining to what it was doing and how it worked. Let’s hope more of those in the NHS look upon this type of thing so favourably! The costs of diagnosis with a long term chronic condition: not just a financial burden… #DBlogWeek…? Really encouraging read here Tim, glad to see the NHS staff listening to the ”expert” in the room. Would be interested to see if they had let you keep the setup running during an op!! I agree – it would have been very interesting! I work in a Diabetes centre in a different region of the country, and while I hope my colleagues would be as positive and interested as those you have encountered, I wouldn’t bet on it. We are decades behind in terms of technology, as you will have appreciated from the reporting on how the recent cyber attack has affected our systems. I have only recently started reading your blog, and am still working towards understanding all the terms and systems you are using. I am so excited at your results, and at your pioneering of such revolutionary methods. But a minute later I am back in the real world, where in our area CGM has not been shown to improve outcomes and therefore is not funded. Anyone less intellectually able, suitably motivated and financially solvent cannot achieve the results that I now see are possible. Hi Lola, thanks for your feedback. Always pleased to help people understand “The Art of the Possible”, and boy what that potentially could be! Your point on CGM is well known and was the reason for my survey last year. At around the time I posted this article and report there were a couple of additional reports that showed CGM having an effect. I’ll have to try and find them. The key point being that in motivated people, CGM makes a statistically significant beneficial difference. Upcoming solutions like the Medtronic 670G will provide solutions for the greater majority of people, but it will require education and unfortunately, a lot more money than is currently spent. Interesting to hear how this technology is “viewed” when we are in hospital. I have worn a Dexcom G4 for 18 months and have been an inpatient on three occasions during that time, for chest infection as a consequence of being on an immuno suppressant to help control a rare autoimmune disease called “vasculitis” (inflammation of the blood vessels). When I have shown my Dexcom to doctors and nurses, they are all really impressed, and many ask …”is that available on the NHS?”. So I then educate them on the power of this brilliant technology and mention that in the data I have collected from real users (Dexcom & Libre), most experience an HbA1c reduction of around 2%, so those at 9% before can get down to ~ 7% after 6 months use.